Partially for security, but primarily as a piece of mind against electrical fires I've been wanting to install a cut-off switch for a while now. Most of these switches come with a red plastic key which you can remove, but I knew that this would just mean I'd lose it or, due to the size of these keys, I just wouldn't take it with me. Additionally the security benefit of removable red keys is a bit dubious as most thieves targeting classic cars will likely carry one themselves. So I opted for an old-style Lucas fixed black knob which is unobtrusive against the black carpet behind the seat and is less likely to be damaged by or get caught up with items stuffed behind the seats. The hardest part of fitting it was ensuring that it didn't foul the battery and the positive terminal was still accessible if needed. 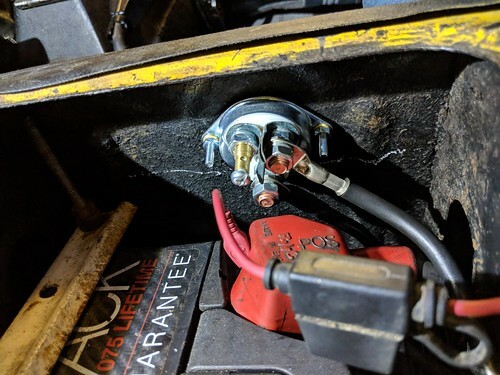 I also bought some long battery cables and made a new earth connection on the battery box. As I have removed the clock from the car there is no need to hook up a fused trickle lead across the poles of the switch, but the option is there if I need in the future. Having the cut-off means I rarely have to hook up the battery conditioner and as a side benefit means I no longer have to worry that I left the lights on when I park the car up in the street as I always use the cut-off before exiting.